This outfit is from April 4th, 2018. 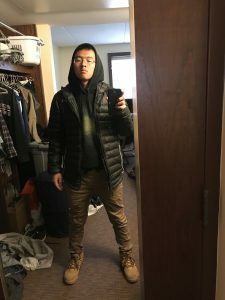 In this photo, I am wearing an iridescent pattern Jordan hoodie, khaki jogger pants, an Under Armour puffer jacket, and Nike sneakerboots. The Jordan hoodie is fairly new, having aquired it in January. It is quite comfortable and warm yet still pretty lightweight. I am wearing the hoodie underneath the puffer jacket because of the temperature. On this day, the temperature was in the 20’s to 30’s degrees Fahrenheit. Therefore, it was necessary to wear multiple layers of warm clothing and keep myself from becoming cold. I own several pairs of khaki jogger pants, so this item is something common from my wardrobe. They are stylish yet simple. Finally, the sneakerboots were a necessity given the weather. In addition to the cold weather, there also was a small amount of snow. Because of that, I chose to wear boots in order to keep my feet warm and dry. Not pictured is a Jesus piece pendent that I wear everyday. It represents my faith and is a nice accessory to have. I appreciate that you really take the weather into consideration. Ohio weather changes every day and, therefore, it is necessary to check before dressing yourself in the morning. I really like the boots because they not only go with the outfit, but they look warm and comfortable. Overall this is a great post and outfit choice! Your bottoms and your puffer vest look pretty good. One recommendation I would probably make in the future is to replace your hoodie with a crew neck sweater or a plaid button up instead, which would elevate your look. I like the muted color choices and pop of green in this outfit. I would wear a scarf in the green family to make it more tied together. The pants and the shoes go together perfectly and fit well with the hoodie. I can tell that you were going for a casual yet stylish look which I really appreciate.